Bellairs’ preoccupation with the occult was, I think, several layers more complex and esoteric than the more traditional ghost stories I typically found in the library, and correspondingly struck me as something much wickeder, with potentially apocalyptic consequences. Even though M. R. James is considered Bellairs’ most immediate stylistic influence, in my head he’s more immediately the YA answer to Lovecraft (who is also a James descendant, of course). I hadn’t ever encountered something like his red doomsday skies, resurrected corpses, and convincingly evil necromancers before. That mixture of human wickedness and imminence of the terrible sublime – very Lovecraftian, it seems to me. The car raced on, spitting stones from under its tires. Down into hollows bordered by dark skeletal trees, up over high hills, on and on while the setting moon seemed to race to keep up with them. They covered a large part of Capharnaum County that night, because the way around was a long way. After what seemed like hours of driving, they came to a place where three roads met. As the car screeched around the turn, Lewis saw – for a few seconds – a Civil War cannon white with frost, a wooden church with smeary stained-glass windows, and a general store with a dark glimmering window that said: SALADA. The only place where I felt a bit let down was in how perfunctory the characterizations felt. The characters are crisply drawn (Lewis is chubby and constitutionally sad and left-out; his Uncle Jonathan is charmingly blustery; etc.) but, for this adult reader, not terribly compelling; they felt a bit like placeholders to me. On reflection, I suspect this may be symptomatic of the book’s very short length, more than any immediate creative faults on Bellairs’ part. 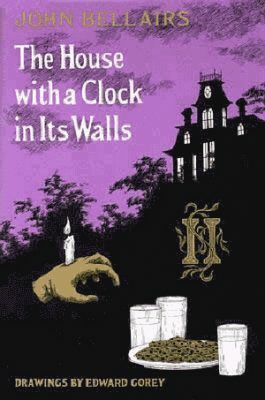 So there’s a significant part of me that wishes that we could also sample from the universe where Bellairs, as originally intended, had been allowed to publish his series as horror novels for adults. Given that unfortunate impossibility, I might have to see about gradually collecting his books in the original Gorey editions. Gimme those mummies and talismans! Awww you did end up rereading this! I am so eager to pick this up now, especially since all my bookish adult friends seem to have gone through a delicious Bellairs phase. Unfortunately, I have finally accepted that characterizations tend to be prefunctory in my YA rereads… at least more so than when i first read them. I think it’s a symptom of length and audience…. maybe not so bad. Certainly useful in a Book of Virtues way for younger children? Also… isn’t it crazy how the stuff that actually scares you has evolved so much? Please do read this! (Can I mail-lend you my copy?) You would love it so much, especially now that it’s October. It’s a perfect one-rainy-afternoon read. I’m still agonizing over whether this must be so! I feel like it simply doesn’t have to be the case because there are so many YA novels with characters that follow you around for days afterward. But of course different books are trying to do different things. I think when we’re smaller it’s also just so much easier to invest even slight suggestions of emotion, sensation, or character with so much more depth and breadth. Kakaner, I am SO BUMMED over how desensitized I’ve become to scary things. I’ve been loading up on ghost stories (again, because it’s October), and I wish I could lower my threshold for subtly creepy things again because neither Machen nor James have been doing for me, and that’s just not right.